Kotonowaka's retreat: the mountain recedes! Finally, the time has come. The elder of the makuuchi division, former sekiwake Kotonowaka, is retiring, and sumo once again loses one of its emblematic figures from the glorious epoch of the 1990s. Yet, Kotonowaka's retreat on the evening of the 13th day of the Kyushu basho was not a surprise. It was anticipated by the press. His master, former yokozuna Kotozakura who had become the 12th Sadogatake oyakata, was about to celebrate his 65th birthday on the 14th day and so couldn't lead the Sadogatake stable any longer. So Kotonowaka, the oldest of the wrestlers, the son-in-law, and the adoptive son of Sadogatake oyakata, naturally had to inherit the position of shisho (master owning the stable). And thus his career as a wrestler had to end. But far from regretting that his retirement was necessary for these administrative reasons, Kotonowaka revealed to the press that with all his injuries, particularly his knee, he would much rather have retired earlier. But in honour of his master and adoptive father, he forced himself to go to his utmost limit, to conclude a magnificent career, a career which deserves to be told. Mitsuya Imano was Kotonowaka's real name, and he was born on May 15th, 1968, to a family that already had two sons, in the town of Obanazawa in Yamagata prefecture. His father, who strongly desired a daughter, took this birth very poorly and raised young Mitsuya as a girl. To affirm himself in these difficult circumstances, Mitsuya devoted himself to combat sports in spite of his very gentle character. Along with his brothers, he took part in judo tournaments where he excelled, and by the time he finished junior high school, his exceptional frame and athletic qualities earned him a fine reputation. While wondering which senior high school to attend, he was approached by an influential man from his prefecture, very closely related to Sadogatake stable, who earnestly persuaded him to join the world of professional sumo without further delay. Faced with the disapproval of his parents, who were quite well off, Mitsuya managed to convince one of his professors to come and explain his sincere motivation to them. The ploy worked, and there he was, enlisted in the Sadogatake stable! His first steps in sumo almost never happened. In fact, so nervous was young Mitsuya at the thought of finally passing the medical examination in Tokyo that he appeared there with hypertension of 170 and failed. After contemplating returning home, he passed the make-up medical examination and was finally accepted at the same time as the future sekiwake Kotonishiki, who would become his lifelong comrade. After his debut in May 1984, Mitsuya was known as Kotoimano. Far from setting the dohyo on fire, young Kotoimano experienced a difficult debut in sumo and climbed very slowly up the banzuke with some notable setbacks. In fact, Kotoimano remained very emotional, and had trouble succeeding in crucial bouts when his kachi-koshi was in question, which resulted in a good number of light 3-4 make-koshi. His teenage body was still growing, his height eventually reaching 191 cm, his weight getting as high as 181 kg. Profiting from his height and weight advantage, he affirmed his style, involving his opponents in long bouts, often longer than one minute, where his pugnacity and endurance made the difference. He was fearsome from the moment he got an outside belt grip with his left hand, even if he did enjoy taking his time. He preferred basic exercises, in particular shiko, for strengthening his lower limbs to make them capable of enduring these long bouts, and after 6 years, he ended up becoming a sekitori and taking the shikona Kotonowaka that made him famous. After a short period of time adapting to his new life, he made a definite entry in the highest division in March 1991, never to leave it again, establishing there the 4th longest reign in history with his 90 tournaments in makuuchi. Although delighted to have caught up with his rival and friend Kotonishiki, for a long time Kotonowaka suffered the fate of elevator rikishi with the rule of a make-koshi every other tournament. In fact, Kotonowaka's sumo didn't succeed against quick wrestlers sufficiently skilled at preventing him from getting a grip on the mawashi or evading his strength in the last moment. His progress was slow, but palpable. Paradoxically, it was against the high-ranked wrestlers that he realised his best performances, since the majority of those wrestlers fight without evading, relying on their pure force and technique. As his weight continued to grow, so did his strength. Finally he realised the goal of reaching sanyaku, becoming a komusubi for the Aki basho 1993, but he didn't stay there for long. His private life noticeably changed with his marriage, in March 1996, to the daughter of his master Sadogatake. And as it is often the case, this was felt in his sumo. In the Nagoya tournament, in July of the same year, he beat one after the other, the two yokozuna Akebono and Takanohana, winning his first two kinboshi. He would always be extra motivated against the yokozuna, in order to give fans a spectacle worthy of that name, and he would be a terror for these champions, forcing them to surrender another 6 kinboshi during his career. Nevertheless, he still hadn't managed to become a sekiwake like Kotonishiki. In November 1997 his wife gave him a son, and that seemed to motivate him to accomplish his goal. 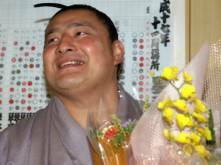 He was finally promoted to sekiwake in the Hatsu basho 1999. The experience would not last long, only two tournaments, and that would also be his last time in sanyaku. At the time he was 30 years and 10 months old. After his brief sojourn at the rank of sekiwake, Kotonowaka ended up experiencing the inevitable, as the injuries accrued on the giant body of the thirty-year-old. He suffered his first big injury during preparations for the Osaka tournament in March 2000. His left knee came loose, and it wouldn't stop bothering him until the end of his career, even depriving him of participation in 5 tournaments. But his courage didn't let him down, and he continued to climb the dohyo to fight against the wrestlers much younger than himself, facing all the risks and dangers. Near the end of his career, Kotonowaka got more and more involved in the life of Sadogatake beya, since it was obvious that he would inherit it when former yokozuna Kotozakura reached his 65th birthday. 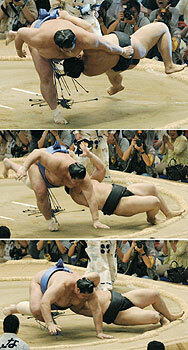 He assisted with the first steps into sumo of such promising wrestlers as Kotomitsuki, Kotooshu and Kotoshogiku. But in spite of his unofficial oyakata status, he didn't let himself deteriorate, and delivered to the public some formidable bouts with high-ranked wrestlers. The whirling Mongolian yokozuna suffered the same punishment as his prestigious seniors Takanohana and Akebono, conceding two kinboshi to Kotonowaka during 2003. Just after these glorious deeds, when he was 35 years old, Kotonowaka suffered a string of grievous injuries, with a terrible rupture of crossed ligaments. Many thought that the stolid mountain had already given enough and that the time had come for him to hang up his belt. He thought so, too, but Sadogatake oyakata, his master and adoptive father, persuaded him not to quit sumo due to such a bad experience. And it was good he didn't, because on the eighth day of Nagoya basho 2004, Kotonowaka took part in a legendary bout against Asashoryu, even if he had to concede defeat. When Kotonowaka, once more going all out in a bout against a yokozuna, executed a magnificent throw with his favourite left overarm belt grip. The yokozuna found himself with all four in the air, and was set to crash down on the dohyo back first. But the yokozuna decided not to lose in spite of his hopeless position, and instead he performed an impossible throw on Kotonowaka, keeping his own back 10 cm from the ground!! It was never seen before!! The rule, which states that a victorious wrestler has the right to put down one hand on the dohyo in order to prevent an injury to his already defeated opponent, did not apply because the yokozuna forced Kotonowaka to touch the dohyo with both hands before he himself did!! Never admit defeat against those stronger than yourself, such was Kotonowaka's motto. 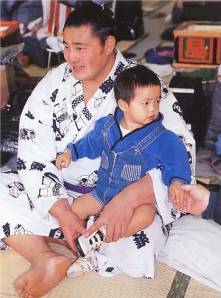 In this Kyushu basho 2005, he became the wrestler with the longest stay in the maegashira ranks, with 81 appearances. Let's wager that this record will push him to set others, in his new function as the 13th Sadogatake oyakata.